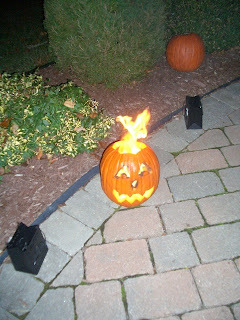 Remember that Batwing pumpkin I posted about, way back when? Ok, so you have to squint and use your imagination. I’m just trying to keep it interesting, people. There’s only so much excitement to be mined from writing about vegetables. There were a total of 18; three went to my in-laws and three went to my neighbor’s children (for helping me plant fall mums in my window boxes) before I snapped this photo. Now that I’m thinking about it, I should give some to my parents, too. In celebration of pumpkins, nothing says fall like a pumpkin spice martini. We discovered these last year, when we purchased a bottle of Hiram Walker’s Pumpkin Spice liqueur for Halloween and tried to figure out what to do with it. The result was the martinis. The liqueur is only available in the fall, so once we used it up last year, no more pumpkin spice martinis. Imagine my excitement when J brought it home this year. Fall has officially begun! Combine the vodka, Bailey’s and pumpkin spice liqueur in a shaker with ice. Pour evenly between two martini glasses, and sprinkle cinnamon and nutmeg on top. This year was the best year for pumpkins that we’ve ever had. Sadly, it did not meet our expectations. I am delighted by the Jack-Be-Littles (23) and Orange Smoothies (7) that we picked, sad that we only got 2 Howdens and no Luminas. My haunted house with the ghost looks a little lame. J’s monster is much better, mostly because he has the patience to spend an hour carving it, where I whipped mine off in about 35 minutes. 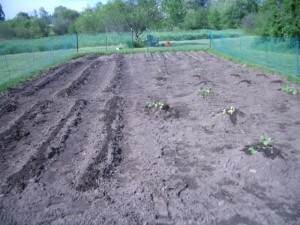 The Nor’easter finally did what a hot summer, Hurricane Irene and benign neglect did not – finished off the garden. We ripped up the eggplants and peppers (although we just had our last meal with eggplant on Monday; there were enough left to do an Asian-style roasted eggplant side dish) and I cut all of the parsley, which was still growing merrily, just as the snow started to fly last Saturday afternoon. We gave half to our neighbor H, who will be selling her house and will probably have moved by next year, which is sad for us but good for her – she’ll be moving closer to her daughter, son-in-law and granddaughter. Hope the new neighbor(s) like fresh vegetables…..